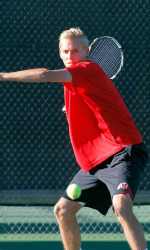 SALT LAKE CITY – On the first day of the 2014 Utah Intercollegiate Tournament, three Utes advanced to Friday’s semifinals. Senior and vice-captain Cedric Willems, the No. 2 seed in Flight A, had a bye in the first round and defeated Marcus Fritz (USU) in the quarterfinals, 7-6, 6-1. He now faces fellow Ute Matt Cowley in the semifinals on Friday at 12.30pm. Cowley won a pair of matches today, topping Juan Canales (BYU), 6-3, 6-1 and then upsetting the No. 3 seed Dennis Baumgartner (USU) in the quarterfinals, 6-3, 6-4. Freshman Santiago Sierra rounded out the Ute representation in Flight A, falling in hard-luck fashion, 4-6, 7-5, 7-5, to Karan Salwan (USU) in the first round. Sierra will now play Jack Swindells (USU) at 11 a.m. tomorrow in the consolation bracket. Louis-Philippe Gascon defeated David Ball (BYU), 6-1, 6-4 in his first match of the day and then topped teammate Jamey Swiggart, who had received a bye, 6-3, 6-4. Gascon faces No. 1 seed Sebastian Schneider (USU) in the semifinals tomorrow at 11 a.m. At the same time, Swiggart will play Andrew Nakajima (USU) in the consolation bracket. Freshman Johan Jonhagen won his first round over Andrew Nakajima (USU) in a tough match, 6-2, 3-6, 6-1, but lost in quarterfinal action to Utah State’s senior Matt Sweet, 7-6, 7-5. Jonhagen will play BYU’s David Ball at 11am Friday in the consolation bracket. The winner of that match will face Justin Archer, who lost in first round action. Gascon and Jonhagen lost 8-5 to Canales and Bourgeouis (BYU) in the first round and will now await competition in the consolation bracket tomorrow morning at 9:45 a.m. Cowley and Sierra had a bye in the first round and will play No. 4 seed Salwan and Swindells (USU) on Friday at 9 am. Willems and Swiggart, the No. 2 seed, also earned a bye and will face Cosmai and Nakajima (USU) on Friday at 9 a.m. Play begins at 9 a.m. tomorrow with one round of singles and one round of doubles. In the case of inclement weather, the tournament will be moved indoors to Eccles Tennis Center. Spectators are welcome and admission to the tournament is free. This entry was posted in Schedule/Results and tagged Utah Intercollegi. Bookmark the permalink.